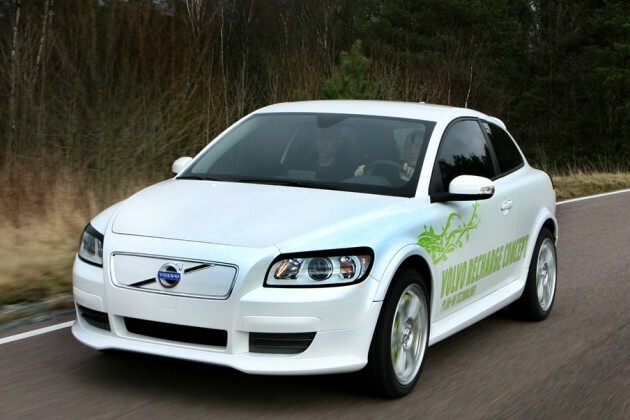 On the outside, the Volvo Recharge is simply a Volvo C30 compact hatchback. But the inner workings of this fascinating concept are what make this car truly exceptional. The Recharge is a series hybrid that uses cutting edge drive train (or lack thereof) technology that allows each wheel to be powered by individual electric motors, seen in such drivable concepts as the Venturi Volage and Eliica. This eliminates the need for bulky transmissions, a large central motor, and axles. So not only will this create less power loss and decreased weight, but you will have more room for cabin space and storage. This plug-in hybrid has about a 60 mile range before a 1.6 liter diesel engine kicks in to generate more electricity. This is all on about a 3 hour charge. Therefore, most daily drivers will never need a drop of diesel. When the combustion engine is aiding the motors, the fuel efficiency is stated to be in the 40 mpg range. The car gets from 0-60 in 9 seconds, which won’t win any stop light drag races, but is sufficient for a commuter car. The Recharge has a top speed of about 100 miles per hour. “I see this project as a positive further development of sustainable personal transport. We have a unique opportunity to take the lead when it comes to innovations for advanced green-car technology”, says Fredrik Arp, President and CEO of Volvo Car Corporation. I hope is not going to be very expensive. It is going to be nice after 10 years to have more quieter cities with electric cars and electric public transportation system.